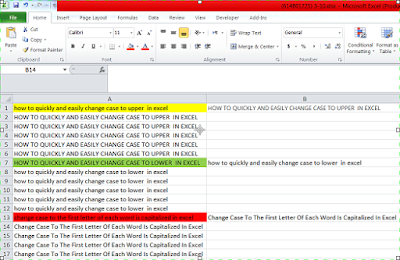 Change the case of text (convert text from uppercase to lowercase or from lowercase to proper case ) Microsoft Excel doesn't have a Change Case button for changing capitalization. However, you can use the UPPER, LOWER, or PROPER functions.Converts texts , letters to uppercase , lowercase or proper case in excel sheet insert function user can easily change letters case in excel sheet. I am using excel on a daily basis in doing my work and my reports. There are times that I need to change something asap, good thing I came across your post, now it will be much convenient for me to change letter case in my http://www.trustessays.com/write-my-essay daily reports.